On Thursday night, I went to see Swans. It was a viciously cold evening, snowing like hell, the wind whipping up and making my eyes water as I marched against the wind tunnel that is Ste. Catherine St., making my way toward Le National. My fingers were actually blue by the time I stumbled in the doors, I was greeted by a nose bleed as soon as I hit the wall of steamy heat inside. I sighed, and bought a drink. It was a strange way to start an evening, but probably appropriate for seeing a band like Swans. The blood certainly was, anyway. This is Swans’ first show in Montreal since June, when they played with another groundbreaking act, Jamie Stewart’s rock n’ roll/avant/partial, electronic/partial, orchestral/partial art piece, Xiu Xiu. This time around, Swans maintained their fantastic taste in openers, bringing out duo Xylouris White, featuring George Xylouir and Jim White of Australian Dirty Three. They were fantastic, not only as a band, but as an opener. They absolutely shredded – Xylouir scampering around the fretboard of his lute, White casually alternating with utmost ease and natural flare between halting, fitful jungle beats and wholly orchestral explosions. The two, who look like a pair of math professors who decided to take a sabbatical and start a rock band, are actually the perfect openers for Swans. They dance and erupt between antediluvian, spasmodic minimalism and soaring ars nova-esque orchestration, all drenched in Xylouir’s mix of Gregorian and Indian chants and flowing moans. In a word, they were great, and they set the stage for the next two and a half hours. I’m just going to warn you: I’m about to talk about my favorite band, so there will be some gushing. Probably a lot of gushing, actually, and I understand why that might put some people off. But, honestly, if you know anything about Swans, if you’re the type of person to be reading this article in the first place, you know exactly why Swans are maybe the most gush-worthy band around. The first thing you’ve got to keep in mind when seeing this band, is that they take their time. Swans are every inch patient skill and honest craftsmanship and you can see it immediately. 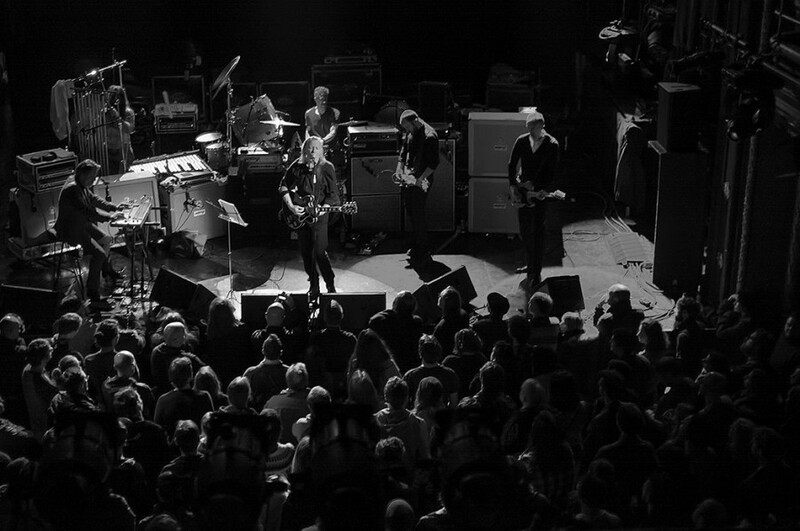 The set opens with about fifteen minutes of gong, each member coming on stage one at a time, beginning with percussionist Thor Harris (aptly named, by the way; he is the spitting image of a Tolkien dwarf king) and ending, after many minutes of rising, falling, flowing cacophony of symbols and low-end hum, with lead singer Michael Gira himself. My earplugs are vibrating inside my skull. My tongue is buzzing. A bottle vibrates off of a speaker stand and shatters, the other bottles look on in horror. Gira can only be described as a god. He is Godly, commands the stage as naturally as a mad shaman in a trance, at other moments like a priest in deep reflection, at others like a terrifying demon, a mirrored image of man’s greatest follies. He chants and moans and screams and twists his classic turns of phrase, little monstrous, totally disturbing isms and anecdotes, depicting Gira’s favorite subject of human misery and the slow lynching that is everyday life in a consumerist culture. His arms splay, palms facing the crowd, chin raised to heaven, he shakes his wrists like he’s rattling something loose, pulls his hands toward each other and closes them like he’s wringing a neck. The man is the bandleader of all bandleaders, directing a bandeau of evil wizards in their cult spells, commanding the stage with the calm assuredness of a hardened veteran. It’s the third time I’ve seen Swans, and I’m even more mesmerized, thoroughly aghast and wholly astonished, as the first time. The set ebbs and flows between near-silent reflection and explosive, gut-wrenching noise, with every beat like an aneurysm, every note a decisive blow to the head. At a certain point, you just give yourself over, you have to, just give in and weep and stammer and convulse like a mad savage, like a young God. I was with several people who had never listened to Swans before, much less seen them, and I was struck by how at home Gira made them feel. They told me that even though the music was overwhelming, completely horrifying at points (in the best way, obviously), they were really touched by how they really cultivated a connection with their audience. The whole show, Gira kept asking to light the audience. “I can’t see your faces,” he’d say. At the end of the show, he brought the house lights up, actually had to insist to a clearly stunned tech staff to do so. Then, after a two and a half hour set, he signed records and cds for like an hour. After all the thought, all the consideration I’ve put into this band, this one quote stands out. Swans have always been about the journey, since the very beginning, when they were creating these huge soundscapes of doom and destruction and sorrow and terror, doing everything in their power to drag the audience down into their pit, going so far as to having venues shut off all lights, lock the doors from the outside, and turn the heat up substantially (I’ve heard it was anywhere between 3° and 15°). Now, in their older age, they’ve still got the same goal, just with different context. They still want to bring you somewhere, but now, it’s a different place. The songs may have changed, the members may have changed, but, honestly, the journey remains the same. I’ll tell you one thing, for certain: With Swans, it’s a journey every single time.